If only my life were so glamorous! Well, I was getting a bit more creatively organized… but then I had to move in a hurry (Oh man, a week without drawing tools nearby – unsettling!). I am now tearing my hair out trying to figure out what I can part with because my stuff does not fit in the living space I have now. In the coming months I’m sure I’ll be putting up some kind of eBay fire-sale style thing. Until then, if you can help me adjust to life in the new place via donations or getting stuff I need, it would be deeply appreciated (I had no idea my claustrophobia had gotten as bad as it has until I was surrounded with boxes up to my neck and couldn’t get out the front door without attempting a bellydancing-worm-wiggle around things). 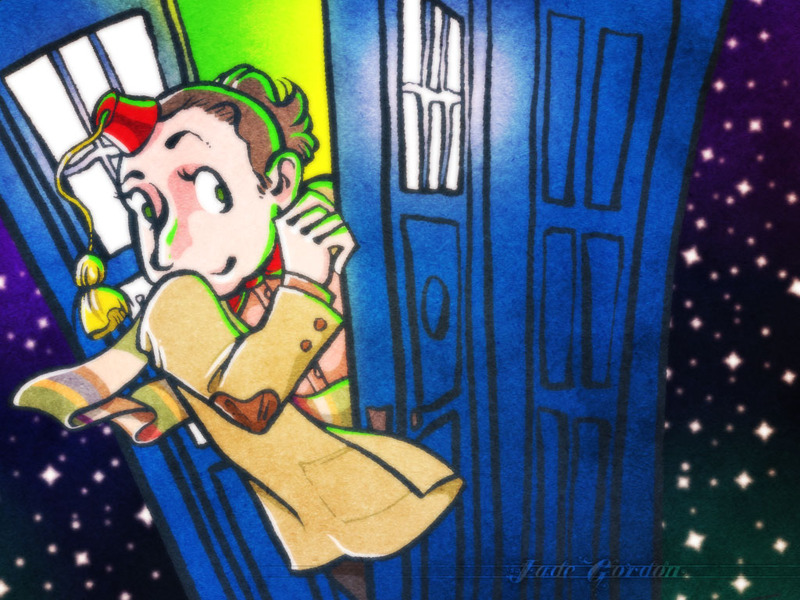 Until I can get back to something more stable, please enjoy this small wallpaper of me in a Doctor Who mash-up costume. This entry was posted on Sunday, November 13th, 2011 at 12:46 am and is filed under Blogs. You can follow any responses to this entry through the RSS 2.0 feed. Responses are currently closed, but you can trackback from your own site.